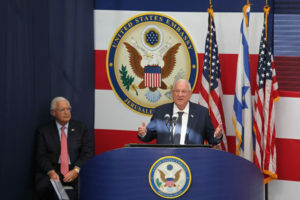 About 800 people, including Israeli Prime Minister Benjamin Netanyahu, Israeli President Reuven (Ruby) Rivlin, US Ambassador to Israel David Friedman, Treasury Secretary Steven Mnuchin, Ivanka Trump and husband Jared Kushner, representatives of the four branches of the US Armed Forces, prominent leaders of the Christian Zionist community and both houses of Congress along with an A-list of Israeli and American government officials gathered in south Jerusalem Monday to mark the official move of the United States embassy from Tel Aviv to Jerusalem. Prime Minister Netanyahu received a standing ovation for his moving address at the opening of the US Embassy in Jerusalem, thanking President Trump for his courage and declaring that Jerusalem, the ancient Jewish capital, will always remain the capital of Israel, according to a report on the World Israel News web site. The prime minister recalled, as a young boy, not being able to walk close to the eastern section of the city for fear of snipers from Jordan. Between 1948 and 1967, before Israel won the Six Day War and reunified Jerusalem, the city was under Jordanian rule and Jews were prohibited from visiting their holiest sites. The Israeli leader stressed his position, and that of the Trump administration, that recognizing Jerusalem as the Israeli capital is not an obstacle to peace; rather, it could help bring peace. This is “a great day for Israel, it’s a great day for America, but I believe it’s also a great day for peace,” Netanyahu stated. “You can only build peace on truth. A peace built on lies will only crash on the rocks of Middle Eastern realities. And the truth is that Jerusalem has been, and always will be, the capital of the Jewish people, the capital of the Jewish state,” he said. Netanyahu saluted the IDF soldiers and all members of Israel’s security forces for defending the Jewish state. “You are the first American ambassador to serve your country in Jerusalem. This is your distinct honor. Nobody can be first again,” he said. Netanyahu concluded by quoting the Prophet Zecharia, in English in Hebrew, who 2,500 years ago called Jerusalem “the city of truth,” and then recited the “Shehecheyanu” prayer of thanksgiving for having reached this day. In a holiday atmosphere punctuated by Sousa marches, Ethiopian-Israeli singer Hagit Yaso and unabashed adoration for President Donald Trump, event organizers distributed red and blue baseball caps with the new embassy emblem before a Marine color guard presented the American and Israeli flags ahead of the Star Spangled Banner, sung a cappella by Marine Sgt First Class Cameron Hubbard. 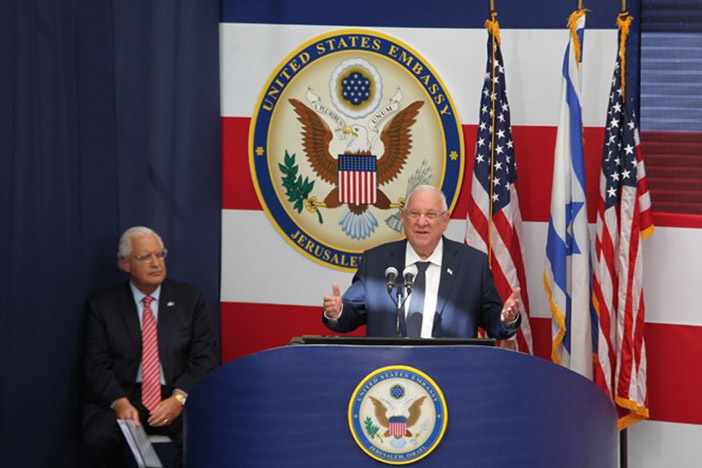 Ambassador David Friedman welcomed a jubilant crowd to the United States embassy in Jerusalem, Israel, drawing a first standing ovation at the words “Jerusalem, Israel” and another at the mention of President Donald J. Trump. 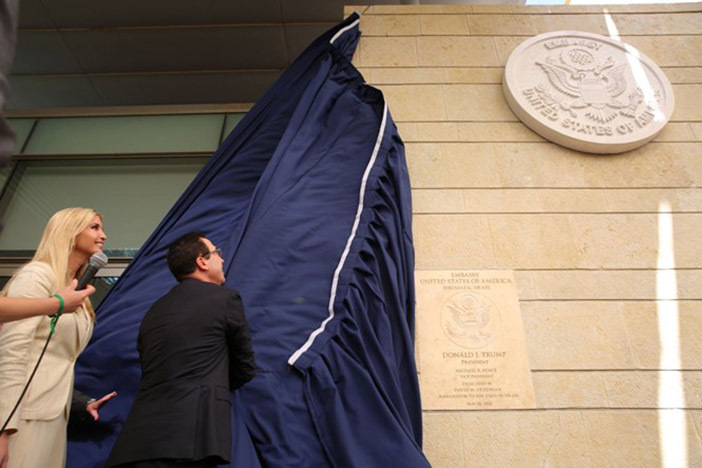 Friedman added that efforts to move the embassy began in 1995 and were reaffirmed last year by a Senate vote of 90-0. 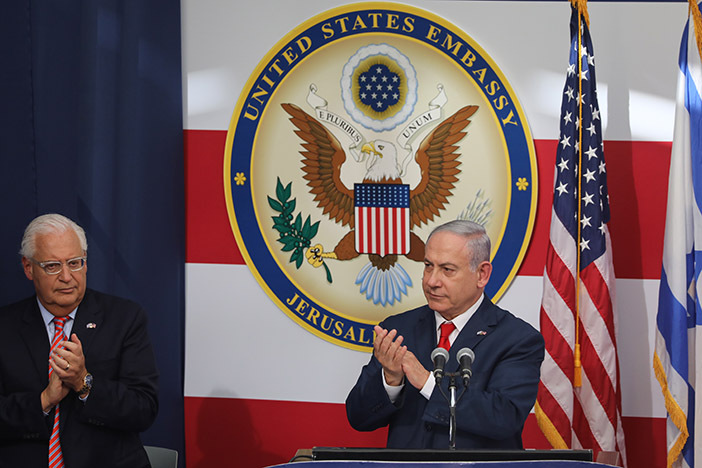 “Twenty-three years after transfer of the embassy became the law of the land, today we give Israel the same right we give to every other nation – the right to name its own capital,” Friedman said. Trump also alluded to the US’ status as the first nation 70 years ago to recognize Israel’s very existence. “Almost immediately after declaring statehood in 1948, Israel designated the city of Jerusalem as its capital, the capital the Jewish people established in ancient times, so important. Today, Jerusalem is the seat of Israel’s government,” he said. “Israel is a sovereign nation with the right like every other sovereign nation to declare its own capital, yet for many years we failed to acknowledge the obvious, the plain reality that Israel’s capital is Jerusalem. “The United States remains committed to facilitating a lasting peace agreement,” Trump added, making reference to the efforts underway by administration officials to hammer out an accord with the Palestinians, who walked away from negotiations not long after Trump took office and have yet to return. The president reiterated America’s commitment to “maintain the status quo” at Jerusalem’s holy sites, referring to the Temple Mount, where Jews are currently forbidden from praying by the Islamic trust that oversees the site. Also addressing the gathering was Rabbi Zalman Wolowik, director of Chabad-Lubavitch of the Five Towns in Cedarhurst, N.Y., and a long-time Torah study partner of Ambassador Friedman. President Reuven (Ruby) Rivlin said the Jewish people had sworn to keep faith with Jerusalem for 3,000 years and prayed for the city before donning a kippa (head covering) and reciting the traditional Hebrew blessing of thanksgiving. “Since the official establishment of the State of Israel 70 years ago, Jerusalem has been the capital of Israel. As President Trump has said, Jerusalem is the heart of sovereignty of the State of Israel. Yes, President Trump – Jerusalem is home to president of Israel, Jerusalem is the home of the government of Israel, the Knesset, the legislature of Israel. Jerusalem is the home of the Supreme Court of Israel. “The State of Israel’s commitment to Jerusalem is not only a commitment to the history of the Jewish people, but it is a commitment to all residents of Jerusalem. Jerusalem is a microcosm – of our ability as Jews and Arabs to live together. And as of today, it is the home of the American embassy in Israel. Thank God,” Rivlin said. In addition, American Evangelical Christian leaders praised the opening of the US embassy in Jerusalem on Monday and praised President Trump for keeping his promise to recognize Jerusalem as the capital of Israel. 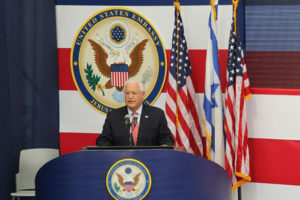 Christians United for Israel’s founder and chairman Pastor John Hagee, who gave the benediction at the embassy ceremony, said that he is “deeply proud” of his country and its president, according to a JNS report. Pastor Mario Bramnick, president of the Latino Coalition for Israel, told the Jewish News Service (JNS) that he was “amazed” by the embassy move. Notably, the event was far from bi-partisan. No Democratic congresspeople attended. 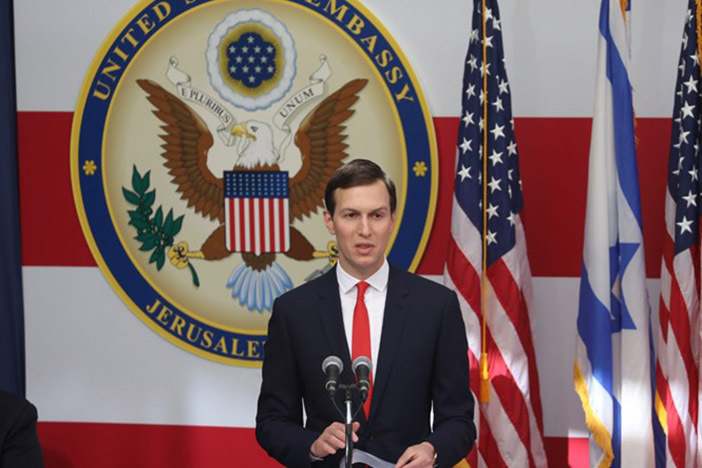 In addition to politicians and public figures, attendees appeared to be overwhelmingly Orthodox Jews and evangelical Christian clergy, including prominent members of US Jewish and Christian organizations who have long pushed for the embassy relocation. 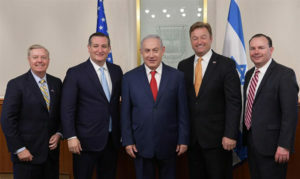 Several individuals noted that the lack of bipartisan support for the move was merely an illustration of a trend that has been developing in North America for years: The waning of Democratic support for Israel and the deepening of Israel’s position as a wedge issue. “It’s true that there are no Democrats here and I think it’s really too bad. I see the Democratic Party as a sister party (to the Israel Labor Party), and it’s important to remember that this whole process began under a Democratic administration (President Bill Clinton),” opposition leader Yitzhak (Bougie) Herzog told TPS. “So this celebration really belongs to all of us. “At the same time, we must give credit where credit is due. President Trump made a brave move; he deserves the credit,” Herzog added. Herzog also said he expected more countries to follow the American lead and addressed the Palestinian violence on the Israel-Gaza border. “What’s going (in Gaza) is very serious, very painful. I tell Palestinians, who are sending their kids and teenagers to the border – violence won’t help you. In 70 years – you’ve never gained anything by violence. Come back to the negotiating table. Don’t use violence,” Herzog told the Israel Broadcast Corporation (Kan). Others were less concerned about the lack of bi-partisan support for the move. 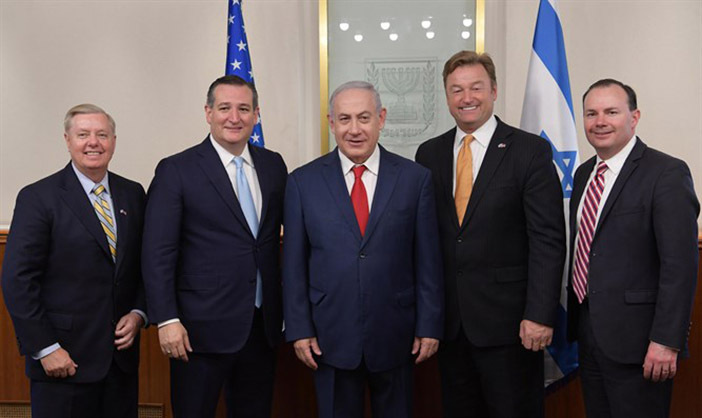 The Orthodox Union (OU), the oldest and largest umbrella organization for the North American Orthodox Jewish community, brought together a broad gathering of Israeli CEOs, U.S. and Israeli politicians, and Jewish leaders to celebrate the U. S. Embassy move to Jerusalem. The program, which took place a few hours before the official ceremony and acknowledged the culmination of decades of advocacy work by the OU, was geared towards showing gratitude to President Trump and his administration for publicly recognizing Jerusalem as Israel’s capital. The event took place at the Waldorf Astoria Hotel in Jerusalem and included addresses by Mnuchin, U.S. Ambassador David Friedman; Florida Gov. Rick Scott; Israel’s Minister of Education Naftali Bennett; Israel Justice Minister Ayelet Shaked; Israel’s Minister of Jerusalem Affairs and Heritage Ze’ev Elkin; Member of Knesset and Opposition Leader Yitzhak Herzog; and former Israel Chief Rabbi Yisrael Meir Lau. Special Representative for International Negotiations Jason Greenblatt was recognized by the organization for his commitment to bringing peace to the Middle East and his crucial role in advocating for the embassy move. Israel’s Justice Minister Ayelet Shaked on Monday called President Donald Trump the “Churchill of the 21st Century” at the OU breakfast. Shaked appeared to compare past U.S. presidents’ refusal to move the embassy to Jerusalem to former British Prime Minister Neville Chamberlain’s appeasement of the Nazis prior to World War II. Winston Churchill was the British prime minister who followed Chamberlain and led the war effort against the Nazis during World War II. 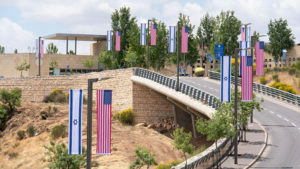 The NCYI has long advocated for the United States to abide by the Jerusalem Embassy Act of 1995, which made it clear that it is U.S. law that a united Jerusalem is recognized as the capital of Israel and called for the moving of the U.S. Embassy to Jerusalem. 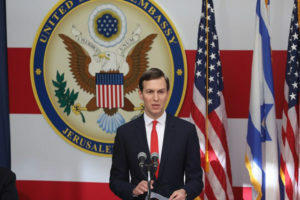 “As the eternal and indisputable capital of the State of Israel, Jerusalem has a fundamental connection to the Jewish nation that touches on all facets of our history as a people, and it is only fitting that the U.S. diplomatic presence in Israel will now call Jerusalem home,” Weiss added. In addition to Weiss’ participation in the Jerusalem ceremony, NCYI Board Members Beatriz Seinuk-Ackerman and Jonathan Brateman took part in a special reception at the White House, where they watched the Jerusalem Embassy opening with members of the Trump Administration. 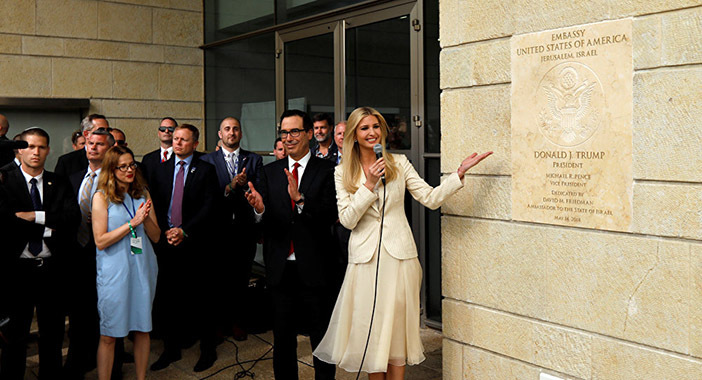 Richard D. Heideman, President of the American Zionist Movement (AZM) also saluted the official opening of the new U.S. Embassy in Jerusalem, the capital of the State of Israel. In a five-minute video entitled “Tel Aviv is Also a Land of Muslims”, Al-Qaeda leader Ayman al-Zawahiri called on Muslims to carry out a jihad against the United States in response to America’s decision to move its Israeli embassy from Tel Aviv to Jerusalem, according to a JNS report. Al-Zawahiri, an Egyptian surgeon, took over the radical terror organization after founder Osama Bin Laden was shot dead by American forces in 2011. Al-Zawahiri railed against the Palestinian Authority as the “sellers of Palestine” and against President Trump as “the true face of the modern Crusade” who could only be met with “resistance through the call of Jihad”, according to a transcript by the SITE monitoring agency. Hamas called on Gazans to engage in violent protests and break through the security fence with Israel on Monday, at the same time as the U.S. embassy inauguration festivities would occur in Jerusalem.